When modelling power generation losses for Business Interruption (“BI”) or Delay in Start-Up (“DSU”) purposes, it is important to understand the type of market(s) the Insured participates in and specifically how it operates within those markets. In this introductory article, we outline the principal differences between regulated and deregulated markets, explaining the key characteristics of each and some factors to consider when modelling losses. In future articles, we will examine specific factors affecting power generation losses in more detail. Deregulated – with less central control and limitations regarding the level of vertical integration allowed. In truth, there can be many subtle differences between power markets, to the extent they can exhibit characteristics of both types of market. This is particularly true of markets that transition from one form to another and over the last few decades there has been a general trend towards the deregulation of global markets. Equally, due to the increasing degree of cross border electricity trading, it is possible that a given generator situated in one market will still have the option to participate in neighbouring markets. It is also important to emphasise that when we use the term “deregulated”, this does not mean the absence of rules and regulations (in fact there is often a complex system of rules in place), but rather we mean that participants generally have more freedom to trade with one another. Whilst the basic structure of power markets is universally consistent from a physical electricity transfer point of view, power markets are generally more complicated and subject to greater variation in terms of their commercial systems. From this point of view, it makes sense to consider how electricity is typically bought and sold within that supply chain and more specifically, how generators interact with other market participants. Capacity – those revenues derived by providing capacity or availability, regardless of whether or not the generator is required to dispatch. This is certainly an oversimplification, but it is necessary to understand the basic distinction when measuring power losses. Other issues such as non-payment of invoices / bad debts. Generally speaking, quantifying losses concerning IPPs in regulated markets are more straight forward than those for generators that participate in deregulated markets as explained below. As we have already discussed, there has been a general trend towards the deregulation of power markets in recent times. Even those markets that we consider to be ‘deregulated’ by modern standards, do not remain static, but are constantly adapting in an effort to achieve maximum efficiency and reliability and to minimise the environmental impact of electricity generation. 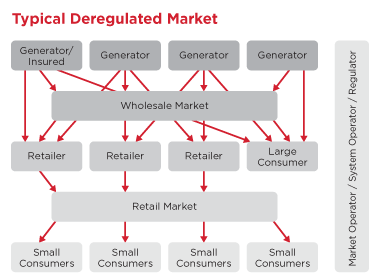 In general terms , deregulation refers to reductions in the degree of central control, which in turn allows the individual participants within that market to trade with one another more freely. When we are assessing BI or DSU losses associated with generators in deregulated markets, we need to understand the way in which they sell electricity. Unlike in a deregulated market, it is less likely (though certainly possible, particularly for renewables) that there will be one overarching contract or PPA. Instead there may be a large number of complex contractual agreements in place for a given generator and there will be more options available to generators in terms of how they sell electricity. It is also important to note that many companies still act as both generators and retailers in deregulated markets, so intercompany trading arrangements can be a significant factor when assessing losses depending on the exact definition of the Insured. 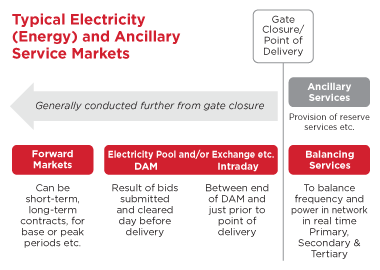 Whilst there will be a large number of possible permutations, the diagram below indicates some of the principal mechanisms via which generators will sell electricity and ancillary services. 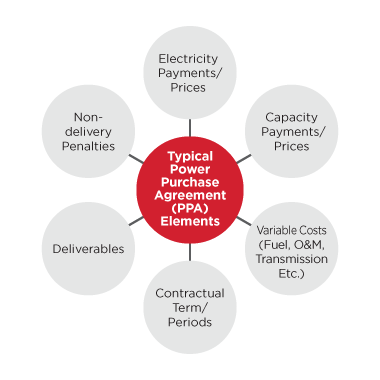 In deregulated markets, not all generators will receive capacity payments, but capacity auctions may be held under which successful bidders will receive capacity payments for finite periods with the condition they meet the requisite criteria. In the event that successful participants are unable to provide the necessary capacity when called upon, penalties can be incurred. 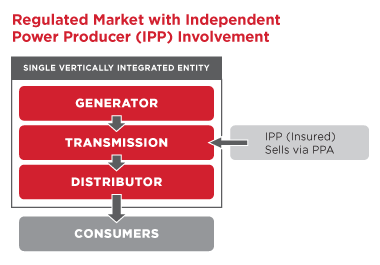 Because generators in deregulated markets have a greater degree of freedom when determining their strategies for revenue generation, it is important to understand the Insured’s strategy, as this could have a bearing on the way in which the Insured, and the wider market, will be impacted by a loss incident. As an example, many generators attempt to minimise risk by selling forward a significant portion of planned generation and locking in prices to guarantee acceptable margins. Depending on the level of forward commitment, this may mean the generator will have to buy-back or reverse its forward positions in the event of a loss, incurring incremental costs. Equally, generators that allow for greater exposure on the day-ahead-market (“DAM”), will have a greater degree of impact on the prices in those markets, which will need to be borne in mind when modelling prices for the projected case. In future articles we will address these and other issues affecting power losses in more detail. Global power markets are constantly evolving. When measuring BI and DSU losses incurred by generation companies, it is necessary to have a good understanding of the market(s) that an Insured operates in and the precise way in which the Insured operates within those markets. In this article, we have provided a high-level overview of the key features of the two main types of markets. In subsequent power market articles we will explore the most common issues that arise when modelling losses in these markets.